If you are not a resident of Russia/CIS we recommend you to subscribe to a PDF-version of the Journal. The cost of the subscription is 80$ per year (4 issues). The subscriber will get a PDF-version of the current issue to an e-mail address (4 issues per year). For filling the subscription form in please click the icon below. PDF version of the Journal. You will recieve the PDF versions of CTT Journal by e-mail (4 times a year). The indicated price is for full year subscription (4 issues). Coiled Tubing Times has won Intervention Technology Award in the category “Best periodical in Russia and CIS countries devoted to oil and gas service”. The Award was established in 2014 by the Russian Chapter of the Intervention and Coiled Tubing Association (ICoTA-Russia). It is the Russian version of the award that is presented annually by the US Chapter of ICoTA at the SPE/ICoTA Coiled Tubing and Well Intervention Conference & Exhibition. 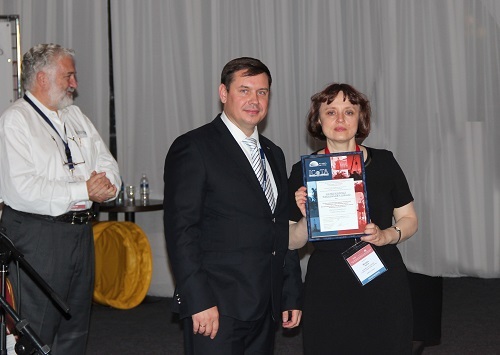 On the photo: Konstantin Burdin, Senior Co-Chair of the Russian Chapter of ICoTA presents Intervention Technology Award to Halina Bulyka, Editor-in-Chief of Coiled Tubing Times Journal.